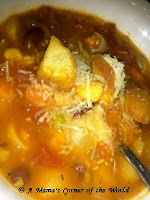 Minestrone is one of our favorite soups. Even during warmer weather months, I find myself making a pot of vegetable or minestrone soup at least once a month—especially when I find myself with some wilting celery or fresh carrots hitting the end of their storage cycle. Aside from chicken noodle soup or chili, minestrone is one of the few soups that all three of my girls will eat as it is. Like always, I find a basic recipe that works—and I change it slightly to give it new life. Essentially I use this same recipe for regular vegetable soup—or a fun, homemade alphabet soup with only a change or two. I know—that seems like a lot of ingredients! But, honestly--after the fresh vegetables are chopped and sautéed, the recipe comes together really quickly! Sauté the Base Vegetables. Here’s my soup secret: almost every soup that I make begins with the first 6 ingredients on this list. Vegetable, lentil, chicken noodle, bean with bacon—sometimes even chili. Begin by melting the butter and heating the olive oil in the actual soup pot that will hold the finished soup. Add the onions, carrots and celery to the hot oil and sauté until the vegetables are tender—usually about 5-10 minutes depending on the size of the vegetable pieces. Add the garlic and pepper, and cook over medium heat for an additional minute. Build the broth. Add the tomatoes and the vegetable broth to the vegetables in the pot. Stir to combine and bring to boil. Finish building the soup. Add the canned kidney beans, using a cup of the water to rinse the bean residue and starch from the can into the soup. Add the tomato soup or marinara. Add the remaining water and the Bay Leaves. Stir to combine and return to a boil. Add the frozen vegetables and simmer for 15-20 minutes. Remove the bay leaves. Add the pasta. Sometimes I prepare this minestrone soup base early in the day—but add the pasta in right before serving. This way, the pasta maintains pasta like texture—and doesn’t absorb all of the soup's broth by dinner time! If the soup is not boiling, bring it to a quick boil. Add the dry pasta and cook in the boiling soup for 10 minutes or until pasta is cooked to desired texture. Garnish and serve. We top with shredded Parmesan cheese and oven baked croutons—seasoned with butter and garlic. Store-bought, flavored croutons work well also. Prepare exactly as above--except omit the kidney beans and pasta. You may also opt to omit one cup of the water as well. Alternatively, you may choose to leave in the kidney beans and the cup of water--and omit only the pasta. Prepare exactly as the minestrone above--except substitute 2 cups of alphabet letter shaped pasta in place of the shell shapes.